Cable-free mobile column lifts from TotalKare are supporting the UK’s future firefighting efforts, following their introduction to a global manufacturer of fleet and equipment options to Fire and Rescue services. Rosenbauer UK’s Holmfirth premises in Yorkshire has taken delivery of a set of T8DC cable-free mobile column lifts, which are being supplemented by the large wheel bump plates to enable the lifting of a variety of specialist vehicles, including the new Panther. 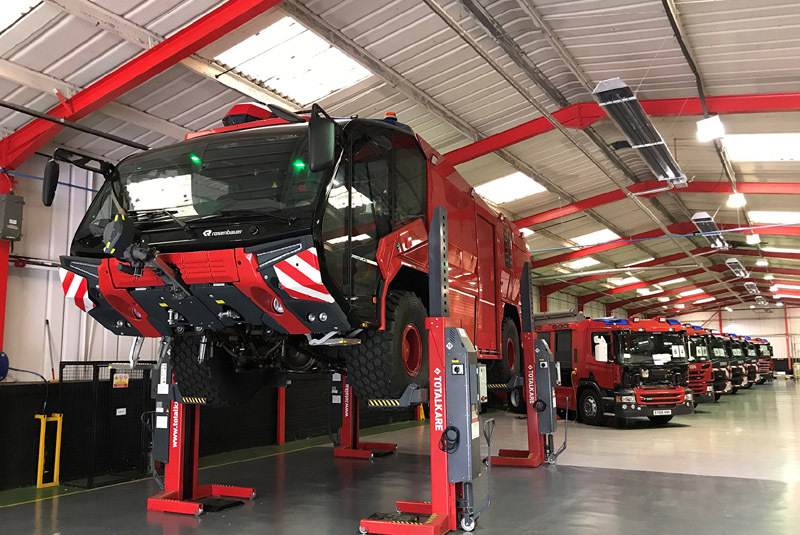 “We enjoy an enviable reputation in the industry as the premier manufacturer of fire and rescue vehicles, but this counts for very little if not underpinned by our high-quality service offering,” said Thomas Gosney, Service Coordinator at Rosenbauer UK. Rosenbauer’s UK division delivers a completely Anglicised range of Fire Service trucks and equipment, backed up by the industry’s most prestigious service team. The company has agreed a comprehensive AfterKare package with TotalKare, which includes regular servicing and Reports of Thorough Examination. For further information, visit www.totalkare.co.uk or follow @totalkare on Twitter.